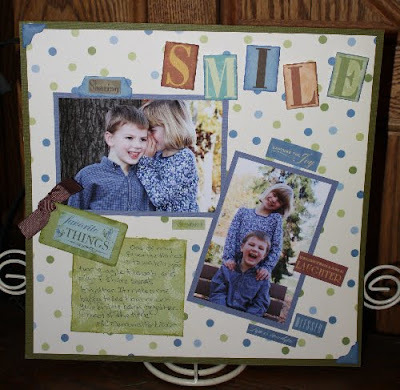 Here are a couple of layouts that I "stuck" during the weekend scrapbooking retreat I attended a couple weeks ago. 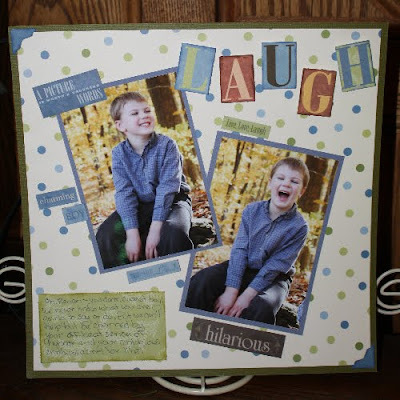 At the retreat, I just adhered the photos and paper, saving the embellishing until I was back in my craft room at home. The patterned paper, letter tiles, phrase stickers and photo corners are all from a K&Company Scrappad To Go. I just inked and layered them to make them my own. I just love these photos and the others that my hubby took of the kids at our annual fall photo shoot. He did a great job of capturing their personalities. More layouts to come soon!